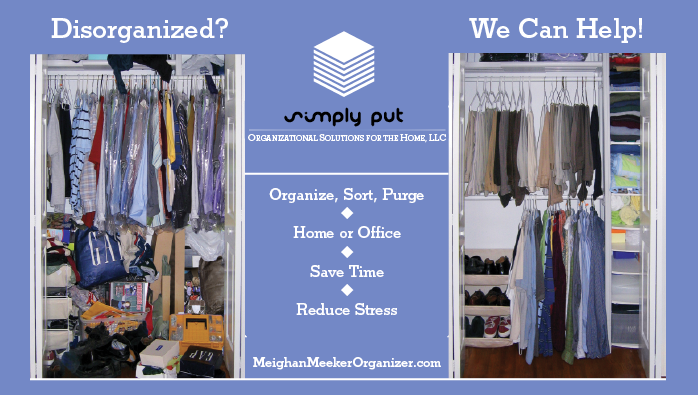 Simply Put Organizational Solutions for the Home, LLC is a full service organizing company. We offer organizational support that will help clients establish and maintain a more efficient and productive living environment. Helping people focus, simplify, and organize their home or office will enable them to maximize their productivity and allow them more time to spend doing things they enjoy. We design, purchase, and install innovative space solutions and organizational systems for home and office environments that offer long-term solutions to meet individual clients needs. Products and services are tailor made, high quality and guaranteed to meet diverse and changing needs. We specialize in closet organization, senior downsizing, corporate relocation/moving, home renovations, space planning, staging, home or office organization, and more. "I cannot thank you enough for suggesting I put my photos and memorabilia into plastic bins on shelving units for better preservation. A few months later we had a flood in our basement and had they still been in cardboard boxes on the floor they would have been ruined. My yearbooks, childhood memories, wedding photos and other priceless treasures will hopefully be around to enjoy and access easily for many more years to come." space planning, corporate relocation/moving, home renovations, space planning, staging, and business organizing are all part of our specialties.